Spent most of last week attending the 24 Hours Of Le Mans with my cameras glued to my eyes. In all, taking home over 11,000 images to sort through. For those of you who are motor or gearheads I strongly encourage you to go. It’s a collection of over 200,000 race fans gathered for one common cause. Friendly fans, fantastic action, and it leaves you wanting to come back. The only minor criticism that I have is the sheer lack of English-speaking help that is available at the track. With 10s of thousands of fans from the US and UK and other parts of the world, it would be nice if the guides at important places around the track knew more than French. I understand that it’s France and they don’t have to speak another country’s language but for such an international event, they could bend their rules. But I digress. So, here is the first batch of photos….there will be many of them, many many, so if you like motorsports keep checking back. If you are not a fan of fast cars and fantastic racing, you have my sympathies. An 8 second exposure capturing the run from Dunlop Bridge down to Terte Rouge. 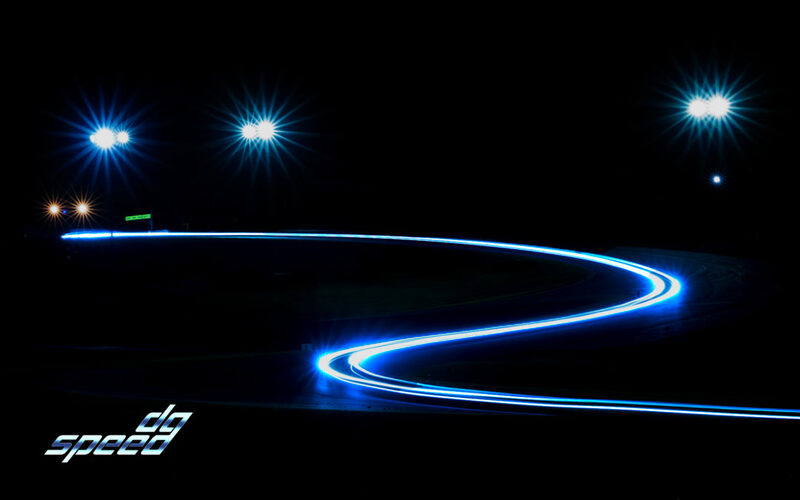 2 LMP2 Cars provided the side by side light trails.